The top of a whiskey barrel at George Washington's Distillery. Still looking for that perfect holiday gift for your perpetually "happy" Uncle Walter or any other whiskey enthusiast in your family? You may want to check out The Shops at Mount Vernon Wednesday morning. That's when another batch of George Washington Rye Whiskey goes on sale. 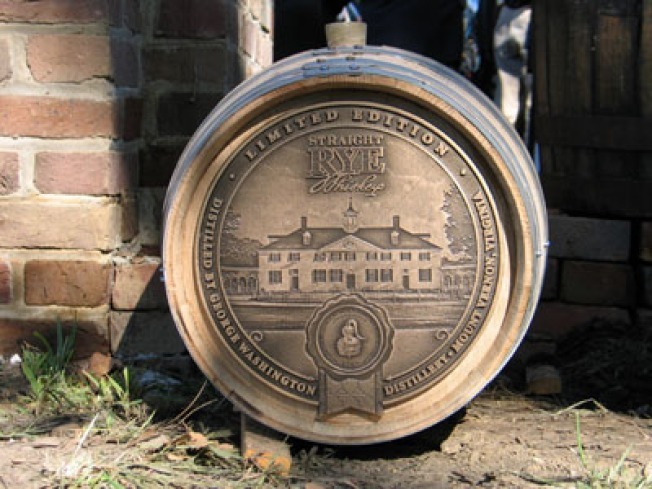 There will be 500 bottles of the un-aged, uncolored spirit available for purchase at 10 a.m. Wednesday at the Mount Vernon Estate and Gardens. The first batch of the twice-distilled spirits, which clocked in at 43 percent alcohol, sold out back in July in just two hours. Each 375 ml bottle retails for $95.